For over 50 years, South Africa’s five-time GRAMMY Award winners, Ladysmith Black Mambazo, have warmed the hearts of audiences worldwide with their uplifting vocal harmonies, signature dance moves, and charming onstage banter. 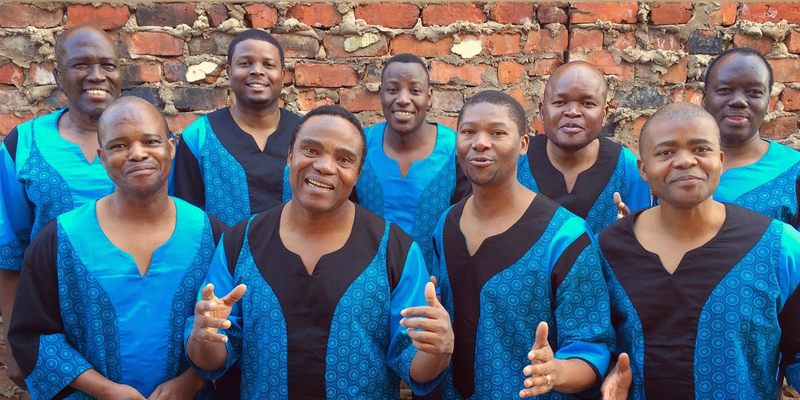 With a deep respect for both their cultural and personal history, Ladysmith Black Mambazo is ever-evolving with an eye toward their long musical legacy. Since the world discovered their powerful a cappella vocals from Paul Simon’s Graceland album, the original members have welcomed a younger generation in their mission, passing along the tradition of storytelling and spreading a message of peace, love, and harmony to millions of people the world over. The younger members, led by the four sons of group founder Joseph Shabalala, who joined the group almost twenty-five years ago, have infused the group with a youthful energy and the promise of a bright future. It was Nelson Mandela who anointed the group “South Africa’s cultural ambassadors to the world,” a designation the members carry with them with the highest honor. There is an additional $3.50 per ticket web fee for internet purchases; call 336-333-2605 to avoid those charges! You can opt to have your tickets mailed to you for a $1 postage fee, or can you pick them up in will call for no charge.